It’s been a while since my last Sansar product update. This has been in part due to the fact that for a time they seemed to vanish from the Sansar events listing (they’re back, but under the more generic title of “Community meet-ups”). However, the following is a summary of the meeting held on Thursday, July 12th, 2018, which was particularly focused on many of the features and updates in the upcoming July Sansar release, due in week #29 (commencing Monday, July 16th). It will be possible to upload custom avatars to Sansar, with skeletons and avatar meshes available through the knowledge base. Custom avatars have a maximum tri limit of 40K (compared to 16K for the default avatars). It will not be possible to clothe custom avatars or add attachments, etc., via the LookBook – they must be outfits prior to upload, hence the higher tri limit compared to the default avatars. The option to change outfits on custom avatars through LookBook might be added in the future. The base tri count limit is seen by the Lab as being for testing purposes, and to potentially allow custom avatars to be dressed, etc., using the LookBook and clothing from the Sansar Store in the future, hopefully without their overall tri count becoming exorbitantly high. As a part of the overall work on avatars – but not part of the July release – the Lab is trying to improve face deformations, etc., to allow for more realistic facial moments when mimicking mouth movements, etc., when speaking. The July release should enable experience creators to define smoother interactions with objects in their scenes. Dynamic objects / bodies will be completely responsive to physics; however, if multiple avatars are interacting with the same object / body, it might vacillate between them. With scripting, physics will be immediately applied in the client, so there may be an increase in perceived lag, as interactions make the client-server-client round trip. These changes will be iterated upon and improved in future releases. Selecting an object within the scene editor will display the triangle count for the object in a display similar to the diagnostics tool. This may eventually be expanded to display further information – creator, etc. The Scene Settings panel should no longer conflict with the Properties Panel. It will be possible to select multiple objects in the scene editor, and apply something like an audio material across all of them, rather than having to apply it individually to each one. The June release included automatic decimation, which was later disabled. With the July release, it will be re-introduced, but made optional. By default, any scene object (static or dynamic) being imported into Sansar will be set to auto decimate. This can be disabled via a drop-down panel option. The auto decimation will not apply to clothing or avatar attachments. New scripts added to inventory: further scripts will be available in inventory by default (exact scripts TBA). Some of these will be packaged with the client, other may only be in specific folders (e.g. the Script API folder). “Simple script examples”: a small library of approximately a dozen script examples designed for use by non-scripters to allow them to achieve object interactions, etc., and which can be stacked together within objects to achieve combined results. These include things like a mover script (for opening / closing doors, moving platforms, etc. ), a switch script (for light switches, etc. ), a sound management script, etc. They will be in the drop-down menu of an object-properties. HTTP API: an http: API will be included in the July release. This will mean that data such as avatar name, avatar UUID, an avatar’s location within an experience, will be shareable with external databases. .FBX animation imports: .FBX files with multiple animations can be imported and have scripts applied to them. Avatar comfort zones: The July release will include comfort zones, allowing people to define how close other avatars can come to their own avatar, depending on whether or not the other avatar is a friend or not. People Search Update: the ability to search for other avatars within the People app is currently limited to using the Avatar ID. With the July release, this will be expanded to allow searches by avatar name, and using partial avatar IDs. Copy chat: it should be possible to copy text from the chat window with the July release. Panel positioning persistence: the client should remember the placement of any re-positioned panels between sessions, and re-open them at the “last used” position, rather than at their default screen location. Bug fixes: the release will of course include a range of bug fixes. The following were discussed at the meeting, but are not part of the July update. Hand Controller / Keyboard Mapping: further work is to be carried on custom keyboard mapping, which will hopefully encompass headset hand controllers, allowing experience creators to define custom operations to keys and buttons (e.g. for use in games, etc.). Events: there will at some point be an update (or updates) to Events to add many of the requested functions to events management (e.g. set recurring events, etc.). Permissions system: this is still being worked on, with the Lab getting “closer” to having something ready to present, but no time frame on when it will appear. User-to-user S$ transfers: this is also being worked on, and it is hoped to will appear “pretty soon”. Aspirational roadmap: it’s been suggested that Linden Lab might follow the example of other platforms and provide an “aspirational roadmap” – a guide to what they’d like to achieve with Sansar’s capabilities over a broad range of periods (e.g. “short term”, “medium term” and “longer term”) which are tied to specific date ranges / time frames. This idea is being taken back the Sansar marketing and product teams for discussion. A relatively recent (I believe) update is the addition of purchasable Sansar dollar bundles, available at fixed prices, and which will be immediately delivered to your account on payment, rather than waiting for Sandex orders to be filled. 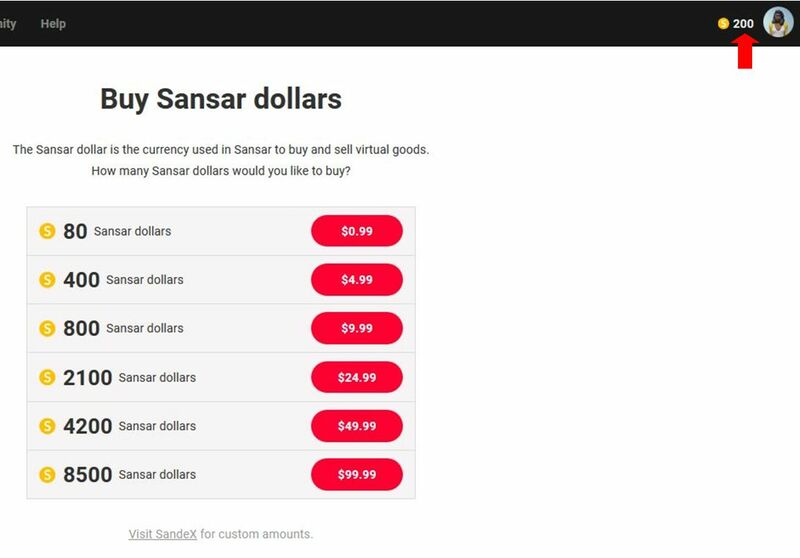 Sansar dollar bundles are available for purchase by those who do not wish to use the Sandex. This list of available bundles can be access by clicking on your account balance when logged-in to the Sansar website (arrowed, top right). Click on your account balance (top right of the Sansar web pages when you are logged-in) to display a list of available bundles. Click on the relevant red payment button to buy a bundle – if you don’t have a payment method on file, you’ll be asked to provide one. Note that the prices for bundles are not necessarily as competitive as buying through the Sandex, as the bundle prices are static. A link at the bottom of the list of available bundles will take you to the Sandex (which is no longer listed in the website’s top menu).